Chelsea produced the perfect response to manager Maurizio Sarri’s weekend criticism to beat London rivals Tottenham Hotspur on penalties and set up a League Cup final against holders Manchester City on Thursday, Reuters reports. 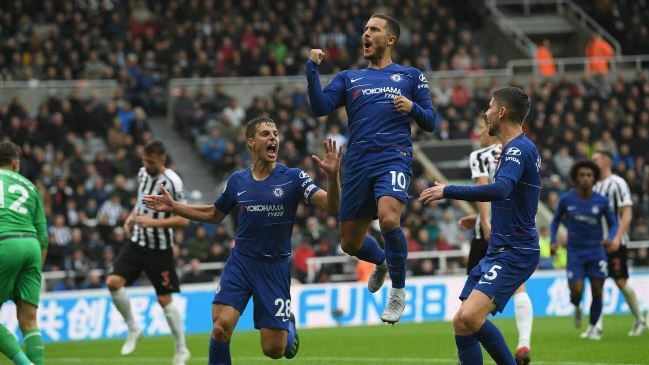 Trailing 1-0 from the semi-final first leg, Chelsea turned the tie on its head with goals by N’Golo Kante and Eden Hazard in the first half but Fernando Llorente struck for Tottenham. Chelsea had 20 shots on target to Tottenham’s five but the visitors held firm to set up a penalty shootout. Christian Eriksen scored Tottenham’s first kick but team mate Eric Dier, hero of England’s World Cup shootout win over Colombia, fired over and then Lucas Moura’s kick was well-saved by Chelsea keeper Kepa Arrizabalaga. Chelsea’s penalties were more clinical and David Luiz slotted past Paulo Gazzaniga to seal victory and send Chelsea into their 15th cup final in 17 years. Tottenham, who were without Harry Kane, scorer of a penalty in the first leg, and Dele Alli, both because of injury, and Son Heung-min who is on international duty, battled hard but their wait for silverware goes on. After the weekend’s 2-0 defeat at Arsenal on Saturday, Sarri accused his players of being difficult to motivate and demanded more his Belgian forward Hazard. “I think that they reacted well tonight,” Sarri, who has never won a trophy during his long managerial career, told reporters. Tottenham, who are four points above Chelsea in the Premier League, looked comfortable early on but fell behind in the 27th minute when Kante’s shot from the edge of the area went through the legs of two Spurs players and squirmed past Gazzaniga — in goal instead of Hugo Lloris. Chelsea went ahead in the tie in 38th minute when a fluid passing move ended with Cesar Azpilicueta’s low cross being side-footed home by a stretching Hazard. Tottenham, who last won silverware when beating Chelsea in the 2008 League Cup final, responded after the break and Kane’s replacement Llorente bundled in a header from Danny Rose’s cross to put them back on level terms overall in the 50th minute. Llorente also wasted a great chance from Eriksen’s raking pass, but it was Chelsea who looked the more likely side to avoid the need for penalties. It was all in vain for Mauricio Pochettino’s side though as they faltered with a domestic final in sight. “We are disappointed but it’s a massive success to get to the semi-final with all the circumstances,” he said.